If it’s time to update your existing website or if you’re looking to build a new website, one of the first things you’ll need to consider is which platform to build it in. It doesn’t matter if you’re building it yourself or paying a web designer to do it for you – ultimately your aim should be to manage the content yourself, so making sure the foundations are intuitive will save you a lot heartache down the track. Recently we took a look at the differences between Wix and WordPress, and now we’re doing the same with Weebly. 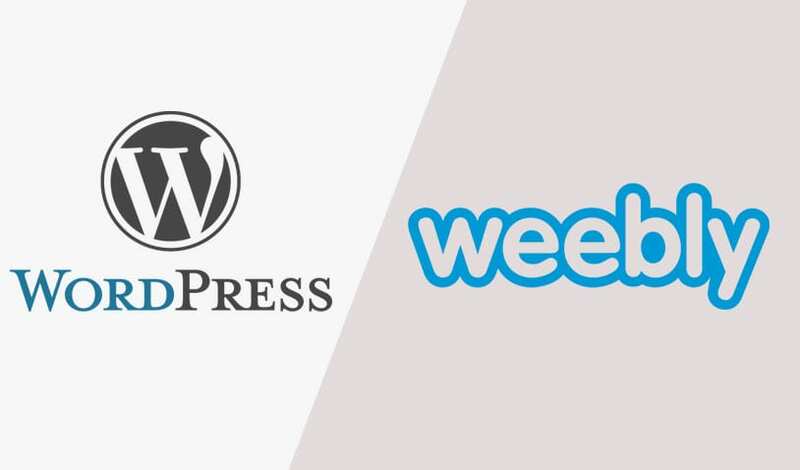 We take a look at the key things you should take into account before you choose a platform, and show you how Weebly and WordPress both stack up. WordPress is a free and open-source platform, which means the codes are open for everyone to utilize and modify. It was initially released 16 years ago – way back in 2003 to be precise, and today it powers more than 30% of the world’s websites. Due to its plugin architecture and templates, WordPress offers a wide array of functionality and design themes. WordPress is totally free (but you still need to pay for the hosting and your domain name), and it comes with loads of plugins and themes – some of which are free and some that you’ll need to pay for. And when we say ‘loads’ of plugins and themes we mean a LOT – there are more than 50,000 plugins and 11,000 themes available today. If you can’t find a theme or plugin to suit your requirements, you’re just not trying hard enough. From a design and flexibility perspective, WordPress is a shining star. You can set up your WordPress site to be anything you want – a blog, a membership site, a content sharing site, or to sell products and services. Since it was originally developed for blogging, it allows your visitors to share their comments with you, but this feature can be turned on or off whenever you need to. There is a seemingly endless ability to customize when using WordPress. Even if you’re new to managing a website, you can easily make basic changes to your site, but WordPress is also robust enough to allow advanced users to make loads of changes. Much of this can be done through the dashboard, although more intricate changes will require changing the code. But the good news is that since it’s an open source platform, many programmers have created their own plugins or themes that they share or sell. Currently WordPress has listed over 56,000+ plugins available, so that gives you an idea just how vast the WordPress community is. You don’t have to be a coding guru to use WordPress – even if you’re a newbie with a little experience using GUI front ends then you can definitely give it a go. And thanks to page builders that allow you to fully customise your website, you can create your pages with a simple drag and a drop process. Drag and drop page builders are widely available as plugins and are built into many popular themes. They make it possible for users of all levels to make changes to the general layout of a theme, and it can make adding those extra flourishes super easy. There are literally thousands of free templates available online. For more about WordPress Drag and Drop page builders, check out our recent blog. WordPress is a tool and just like every other tool it needs to be taken care of so it can perform at its best. The platform is really competitive when it comes to publishing updates and making sure that you are protected. But it also requires all the developers of plug-ins and custom themes to create their own individual updates, making it sometimes troublesome. It also a good idea to copy your whole site prior to updating anything – just in case an update screws with your design. Since WordPress is so widely used, it’s easy to find loads of self-help materials online. There are hundreds of communities full of forums and YouTube channels that offer detailed instructions for just about any support issue. You can get help through many different avenues for this platform but if you’re a DIY’er, don’t expect it to be timely or especially organised. Weebly is one of the fastest growing and longest standing brands in the website building space, and with it you can create an awesome looking website without having to dabble in any code. Weebly has a range of pricing options, starting at free for basic use through to $30 per month (paid annually) for small businesses and stores, and $46 per month (paid annually) if you’re a power seller and want to include real time shipping rates and abandoned cart emails. A word of warning though – even if you have only very basic needs, the free version will display Weebly ads, so definitely not a good look if you are trying to present a professional image to your customers. Weebly is not an open source website builder so you’re not going to be able to control how some of the tools work, although you can edit the HTML and CSS codes, which lets you customise the design of your website to a certain extent. Weebly templates are modern and responsive, and right out of the box, the platform comes with more than 55 templates, all of which are free. On the downside, if you want to integrate non-Weebly tools into your website, or you want certain features to function differently, you might not be able to do this as their core functions are locked off from public access. Weebly is probably the easiest website builder available in the market today, and for the beginner is perhaps an easier platform to use than WordPress. It’s an intuitive drag and drop website builder, so you can just drag in your content and move it around to your heart’s content, all without having to know how to use any code at all. If you don’t have any technical skills, or simply no interest in learning the engine room of website building, then Weebly is a good choice for you to consider using to build your website. Weebly is a closed system and all the technical issues are managed for users. This includes all performance and security updates, so you won’t need to concern yourself with any of the technical aspects of building websites. It all happens in the background, so your site is always up to date, and you won’t have any issues with tools causing conflicts and negatively impacting your website. Weebly has a pretty good help centre, but since the site tools are very intuitive and easy to use, it’s unlikely you’ll need much in the way of support. But if you do need to find out more information about how to use some of the features, there’s a good library of help guides available. If you need more hands-on support, Weebly provides 24/7 email support, and live chat or phone support during business hours. So Which Platform is Best? WordPress is feature rich and highly customisable through all of those plug-ins so you’ll end up with a website that is completely unique and distinctive to your business. Out of the box it’s not as intuitive to set up as Weebly, so we recommend you invest in a Page Builder plug in. Once your site is set up, the content management system is simple to navigate – so if you choose to use a Web Developer to build your site for you, you should be able to manage much of your own content moving forward. Weebly is highly intuitive and extremely easy to build and modify content. It’s an excellent platform if you have relatively simple needs and want to build your own quick and easy website. It’s not ideal though if you have highly customised requirements or want a totally unique design. Got a question or need a hand developing or maintaining your new site? We’re here to help – just check out some of our work here or contact us for a chat. What is the difference between Managed WordPress Hosting vs Shared Hosting For Your WordPress Website? Do you need to worry about the latest Google Update of March 12th? Copyright 2019 Broadcast SEO - SEO Experts In Australia | All Rights Reserved | Rated 5/8 Reviews on Google Business.